Waitakere City Council enjoyed double success at the New Zealand Recreation Association Awards in Christchurch last night. The West Wave Aquatic Centre won the New Zealand Recreation Association (NZRA) Outstanding Pool Award while the Piha Domain’s Story of an Eel footbridge took out the NZRA Outstanding Project Award. The awards were presented at a gala dinner as part of the International Federation of Parks and Recreation Administration Asia Pacific Congress. The accolade caps off a stellar year for West Wave, which is also a finalist in three categories of the Bank of New Zealand Waitakere Business Awards, won the National Swim School Promotion of the Year award from the Swimming Coaches and Teachers of New Zealand and in June ushered in its one millionth customer for the year. The NZRA awards are considered among the most prestigious in the industry and a mark of all round excellence. West Wave Aquatic Centre manager Mark Blake says the win confirms that it is on the right track in terms of service, quality of facilities and overall business excellence. “We’ve worked hard in the past three years in particular, to boost the numbers of people coming through the door, offering them value for money, great customer service and ensuring we have the facilities they want. “We are always striving to do the best we can, the challenge now is to continue to improve and it’s a challenge we are willing to take on.” The centre has experienced impressive growth in visitor numbers and profits, the lap pools are regularly used by local aquatic clubs and around it hosts 80 percent of New Zealand’s national aquatic events. Built for use in the 1990 Commonwealth Games, West Wave Aquatic Centre now includes a 25 metre and 50-metre lap pool, wave pool, hydro slide, fitness and recreation centres. NZRA spokesperson Kirsten Malpas says West Wave’s managers used strong leadership, excellent communication and comprehensive marketing to turn the pool into a valuable community asset and a nationally regarded facility. “West Wave caters for the whole community, offering a broad range of physical activities and health programmes,” says Malpas. “Attendance has increased almost 10 percent in the past 12 months and that speaks volumes,” she says. “During that time more than 100,000 people have taken Learn to Swim classes (up 13.5 percent from previous year), and customer satisfaction ratings are exceedingly high. “The pool managers and their staff are to be congratulated for delivering a truly outstanding service,” she says. The new ‘Story of the Eel’ footbridge in Piha will be officially opened later this month and was praised by the judges as being “outstanding on all levels”. “The council was very holistic in its approach and end result,” says Kirsten Malpas. “They went the extra mile to make the bridge interesting. They engaged the local community in design choices, and considered sustainability across a range of factors. We were very impressed with the project.” The bridge replaces a narrow, steep timber bridge which linked Piha Domain to Piha South Beach. 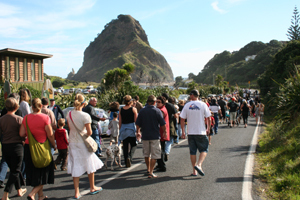 The domain being a popular visitor attraction and council was mindful of consulting Piha residents and other stakeholders, who had an interest in this beautiful coastal environment. The bridge represents a great migratory eel and celebrates the fact Piha Stream is home to short and long finned eel. Its design is by Piha artist Mandy Patmore. 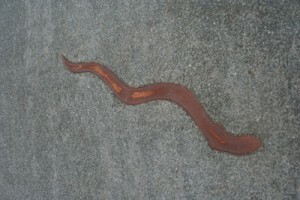 Historically, eels were of great significance to early Maori, featuring in many myths. Eels continue to live in Piha stream because of its excellent water quality. “Having a bridge in the shape of an eel, provides an opportunity to explain the value of conservation to visitors. The bridge has stylized eel life stages inlayed on its floor, helping people understand more about this amazing creature,” says Ms Patmore. Piha’s bridge is one of a number in Waitakere that have been designed by local artists and that have drawn both local and international attention. They include the Rewarewa footbridge in new Lynn, a bridge over the Opanuku Stream in Henderson and McLeods Crossing, also in Henderson.